Mother and son pray before floating their krathong during Loy Krathong at Wat Yannawa in Bangkok. Sunday was Loy Krathong, a mostly Thai holiday, with variations observed in Laos and Myanmar. The holiday originated during the Sukothai period, (roughly 1300s AD) in the Royal Court. Loy (also spelled Loi) is the Thai word for float, Krathong, which doesn't have a direct translation, refers to the lotus shaped vessel that floats. Thais put incense and candles into their krathongs, go to a nearby body of water and watch them float away. They usually say a prayer and make a wish before placing it into the water. The krathongs floating away also represents the release of bad thoughts and feelings. Originally krathongs were made from the trunk of banana trees. A few are still made the old way but increasingly krathongs are made of bread. 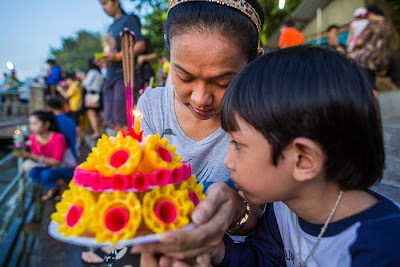 Recently krathongs were made out of foam and plastics but people realized the environmental damage those materials do and reverted to biodegradable krathongs. A family at Wat Yannawa lights up a Yi Peng lantern. In Chiang Mai, Loy Krathong is celebrated with the release of Yi Peng lanterns, homemade paper lanterns that carry a small flame and much like tiny hot air balloons float into the night sky. 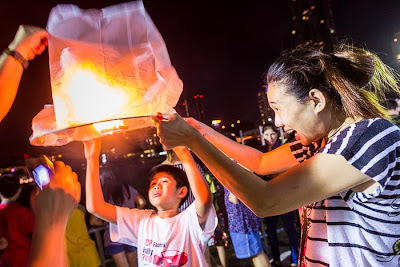 The Chiang Mai tradition is becoming popular throughout Thailand and it's not unusual to see people releasing the flaming paper lanterns in Bangkok. I like photographing Loy Krathong. It's a lovely celebration and a happy day. It mostly takes place after dark though so I generally use high ISO (1600-3200) and wide aperture lenses. My 50mm f1.2 and 24mm f1.4 lenses all get used wide open or close to wide open all night long. Although I had my 200mm telephoto with me, I never used it. The longest lens I used was the Olympus 45mm f1.8 on my Micro 4:3 body (roughly the equivalent of a 90mm lens on full frame). A woman lights the candle on her krathong. I popped a little flash into the this picture using my 430EX II with the flash off camera to my left. For a few of the photos I used a little pop of fill flash. I favor the small Canon flashes, like the 430 EX II, it's relatively small but still powerful enough for what I need. It recycles quickly and has most of the controls of the much larger (and more expensive) 580EX II (now discontinued) or 600EX-RT. I used the flash with a generic off-camera cord, which gives me a more natural, less flash like, image. You can accomplish the same thing if you use Canon's older ST-E2 wireless controller for the flash. Canon's new radio transmitter, the ST-E3-RT does not work with the 430EX II. Normally you would think that for that much available darkness and nighttime photography you would use a tripod. I've found that things happen too quickly at Loy Krathong to make a tripod useful. People go down to the river, say a brief prayer and then slip their krathongs into the river. The moment is gone by the time you set up a tripod. Wat Yannawa, where I photographed Loy Krathong, is one of the most popular places in Bangkok for the holiday and it's too crowded to set up a tripod near the water. 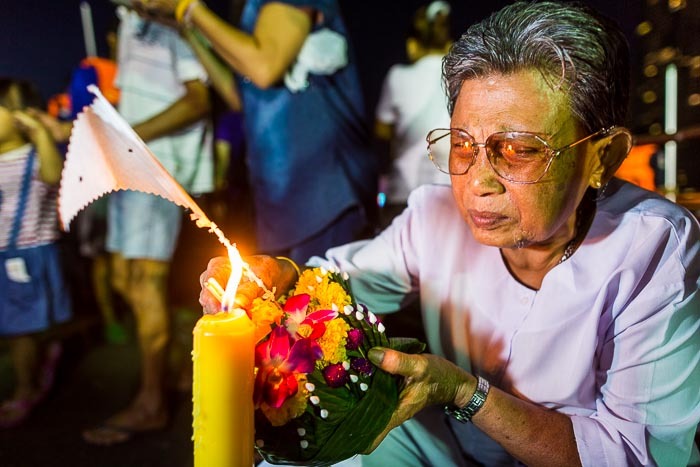 There are more photos from Loy Krathong in my archive or available from ZUMA Press.